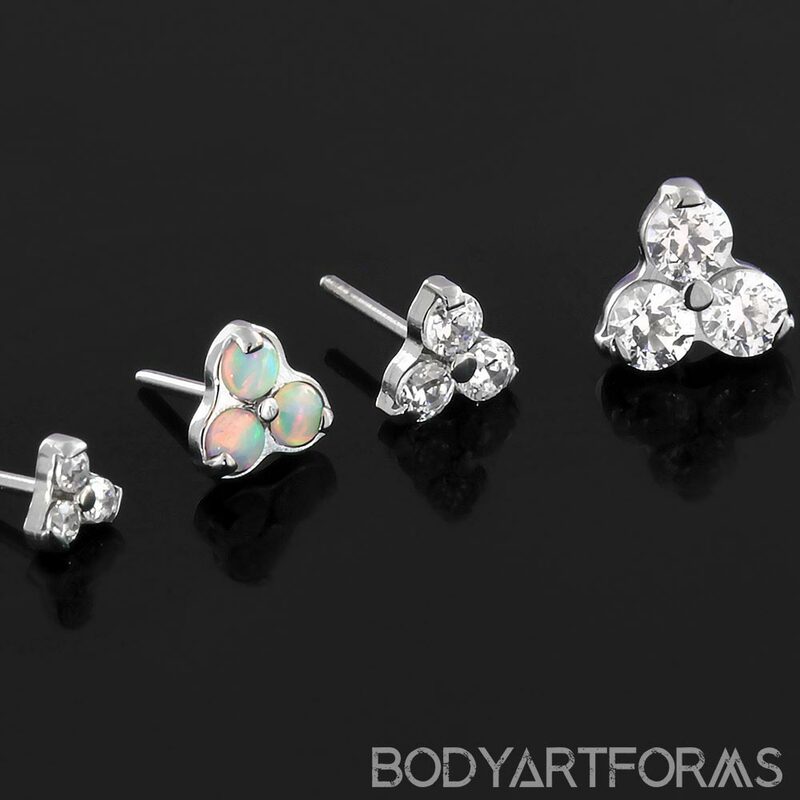 From Industrial Strength, these Menage a Trios ends feature a trio cluster of gems or opals with implant grade titanium settings. The end with three 1mm stones are going to have an approximate 4mm outer diameter. The end with three 1.5mm stones are going to have an approximate 5mm outer diameter. The end with three 2mm stones are going to have an approximate 7mm outer diameter. Threadless ends are made to be worn in threadless posts. For these ends, we recommend these posts. You can check out more threadless jewelry here. Threadless jewelry is a push pin technology. The removeable end (dark grey) has a slightly curved pin. This pin straightens out when inserted into the shaft (light grey). The resulting spring tension force holds the two pieces together securely. STEP 1 - Insert the pin about halfway into the shaft. STEP 2 - Bend the pin SLIGHTLY by hand as shown. For a tighter fit bend the pin more. For an easier fit straighten the pin out a little. STEP 3 - Push in the removable end to close. STEP 4 - To remove, pull apart both ends. If the jewelry is tight, add a slight twisting motion while you pull out the removable end.